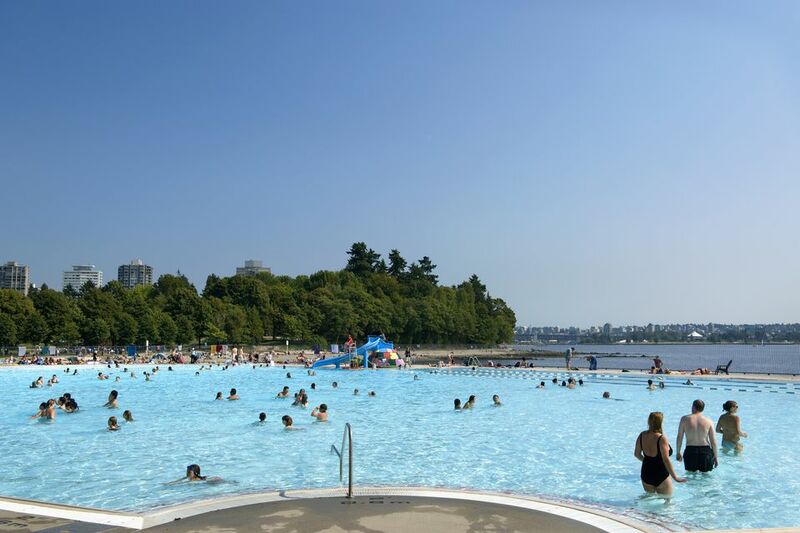 Summer days spent hiking, biking and playing in Stanley Park are one of the great pleasures of living in Vancouver, and if you want to cool off after a hot day--and the ocean is a bit too chilly--swimming in the park's outdoor Second Beach Pool is the ideal way to do it. Second Beach Pool is one of five outdoor, public pools in Vancouver open in the summer season (June, July, August). It's tied with Kitsilano Pool (known as Kits Pool to locals) for the title of "most scenic Vancouver pool:" it overlooks Second Beach and English Bay and boasts spectacular views of the southern city coastline and western mountains. The Second Beach Pool is a heated, fresh-water pool, 5ft deep and 50 metres long. This pool is extremely family-friendly; it's often crowded with kids. There's a playground and the free Variety Kids Water Park nearby. The Variety Kids Water Park is basically a small water-spray park (kids should wear shoes) that's a bit too simple for older kids but that's perfect for toddlers and kids under eight. The Second Beach Pool is located on Second Beach, off Stanley Park Drive. From downtown Vancouver, drivers should head west on Beach Avenue and look for signs for the beach and pool; pay parking is available. You can also walk or bike to the pool via the park's scenic Seawall from English Bay Beach and the West End. The Second Beach Pool is open from mid-May to mid-September. Times vary by month, so check the Vancouver Park Board site for hours of operation and admission costs. You can easily make a day of your visit to Second Beach Pool by combining it with a trip to Stanley Park's other famous attractions, including the Vancouver Aquarium and the Stanley Park Totem Poles. You can also visit English Bay Beach (about a 15-minute walk from Second Beach Pool) or dine at one of the Best Restaurants near Stanley Park.